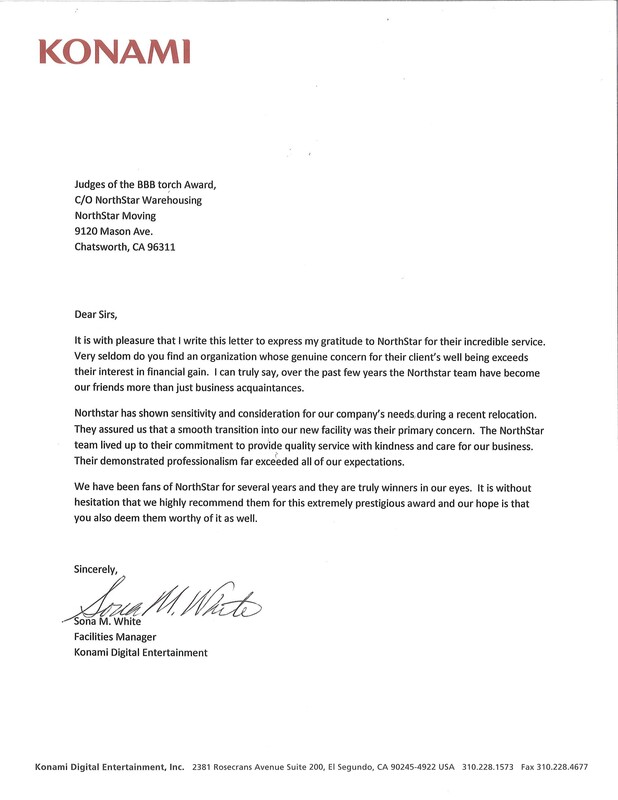 It is with pleasure that I write this letter to express my gratitude to NorthStar for their incredible service. Very seldom do you find an organization whose genuine concern for their client’s well being exceeds their interest in financial gain. I can truly say, over the past few years the Northstar team have become our friends more than just business acquaintances. Northstar has shown sensitivity and consideration for our company’s needs during a recent relocation. They assured us that a smooth transition into our new facility was their primary concern. The NorthStar team lived up to their commitment to provide quality service with kindness and care for our business. Their demonstrated professionalism far exceeded all of our expectations. We have been fans of NorthStar for several years and they are truly winners in our eyes. It is without hesitation that we highly recommend them for this extremely prestigious award and our hope is that you also deem them worthy of it as well.